Lil Ballerinas 7n1 Combo with DRY Slide. This 7-feature challenge is jam-packed with fun, offering a generous area of jumping area, 2 basketball hoops, climb and slide. Perfect for the Ultimate Party! Take a look at our video of the 7n1 Combo. 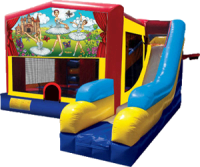 You can see there is a huge bouncy area inside, push your way thru the obstacles and slide down and out to start all over area. There is even a basketball hoop on the outside for even more fun. Check out our4n1 Combo with the same theme. Click the “Reserve Now” button to get a Quote or to Reserve/Book online.